For the last twenty minutes, I’ve been trying to write, a warm cup of coffee beside me and the sunrise behind me…but the toddler has been on me. He creeps up from behind and scales the chair, then he wraps his chubby arms around my neck and flips over the chair’s back onto mine. Then he laughs in my ear. I have to get him off of me or he’ll continue to climb until he’s standing on my neck. The summer sun seems to be making my children grow faster and browner. Q is still asleep and it’s almost seven. It seems like yesterday when I started to blog, and he was two, and waking with the roosters. I thought those days would never end…but they have, for him. Now he’s almost six, can you believe it? I was feeling nostalgic about 2, and wishing everyone would stay that age, when it’s hugs and peek a boo jokes and not as much 5. 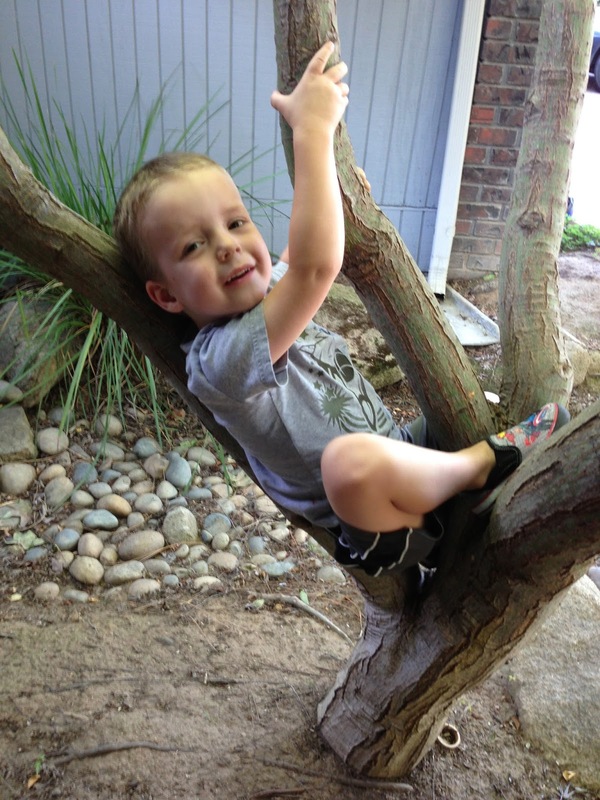 That’s where this post was going…it was going to be about the greatness of 2 year olds. Then I had to leave for a few hours to do stuff, like make eggs and do laundry and talk on the phone for a long time. 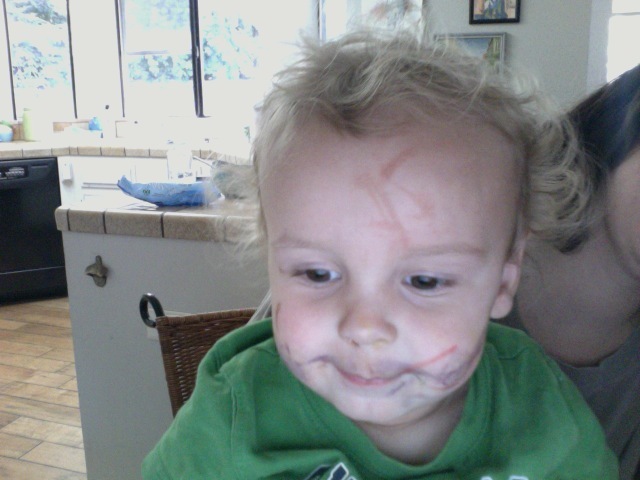 In the meantime, Tobin has managed to color his entire body with a brown marker. This very minute, he is wearing one of my tennis shoes and using it to step on a piece of broccoli I gave him. Why did I give him broccoli? Because I made myself pasta with broccoli and tomato for breakfast and he wanted “bite”. I always know when I’m heading to crazy town when I start making pasta before 10 a.m. When I get moody, I eat noodles. It’s one of my life mottos. All of the children have marker faces. I drew a lion face on Shel, per his request. I drew a dragon face on Q, which was just as hard as you might think. I worked extra hard on it, and he was extremely unhappy with it, so he stormed off and washed it off. He’s five, almost six. Feelings are flowing. I decided to quit. It isn’t noon yet, but I’m quitting. Sometimes you have to, when you’re a mother with a lot of feelings with three boys with a lot of feelings. Do you want to color on your face? Fine. Do you want to eat cereal for lunch? No. Too bad. I am not in the mood to make special orders. Eat your sandwich or go to bed. You can choose. Do you want to scatter shoes from hither to yon for no apparent reason? Fine. I can step over them. Did you just dump all of the markers onto the ground? NOOOOOOOoooooooooooookay. Fine. It’s okay. Let’s pick these up shall we? Almost done, almost…NOOOOOOoooooooooooooookay, let’s try picking them up againnnnooooooooooooooo! Yep, sometimes these days happen. In order to survive I quit. Because long ago I realized that children would rather wear underwear on their head while doing science experiments in the bathroom than be clean and orderly with a mother who can’t stop giving them the evil eye. That last paragraph sums things up for me very well – I need to remember to quit rather than get all huffy and crabby. Sometimes when I quit, I load the boys in the van for Happy Hour at sonic – 99 cents of happiness. Coffee and soda are my noodles. I wish what I always wish when I read you, which is that 1) I didn't understand so well the things you write, 2) I could appreciate the bad days just a little more, 3) I could speed through the bad days while at the same time freezing these years for all eternity, and 4) have you for a next-door neighbor. What book were you reading while eating all the popsicles? This post made me giggle. I ate popsicles while reading a book yesterday too. Geez, I remember those days! I remember the frustration! Cherish those days, though; they're gone in the blink of an eye! Oh, the long days. The long, long days. I'm glad Brandee asked about the book because I was wondering too. I love sipping tea and observing the countryside. I also love underwear on heads, other than my own, but not so much the science experiments in the bathroom. Oh I get this. My five year old scales me as I write, type, …. often. Snuggling him close, and yet being interrupted often, I grin with you, Joanne.